Do you want your crops to be healthy, strong and productive? Our new fertilizer recommendation tool should help. The Polysul-Fit Polysulphate calculator is now available in the App store for iPhones and in the Play Store for Android phones (For China the links are App store and Play store). This powerful, yet simple-to-use tool works out the correct application rate of this remarkable fertilizer to meet a crops’ nutritional needs for healthy, strong and productive growth. With over 40 key crops included and plans to include more in the future, users of the app will easily see how Polysulphate can meet their crops’ needs. Polysulphate fertilizer - which is natural polyhalite - is a soluble, easily-absorbed, and cost effective answer to crop nutrition. It contains four key plant nutrients: sulphur, potassium, magnesium, and calcium. But key to profitability is applying the fertilizer at the correct rate to get the full benefit, without over-applying. To use the app, simply enter your crop, type of cropping, and soil type and the Polysul-Fit Polysulphate Calculator instantly gives you the recommended Polysulphate application rate. 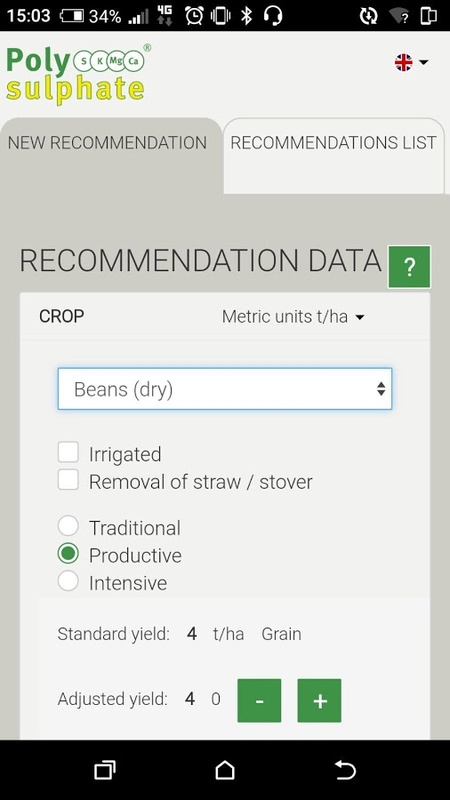 There are additional options to allow you to fine tune the calculation further for irrigated crops, or soil characteristics. You can also activate the free registration to give you the benefit of all your recommendations being saved within the app for easy access, and you can receive your recommendations direct to your email in-box. Currently available in 6 languages, the app is already aimed at a wide global audience, and with other languages soon to be added this should make the app even more widely accessible. Download the Polysul-fit Polysulphate calculator app from the App store for iPhones, or from the Play Store for Android devices (or for China the links are App store and Play store) and see how Polysulphate can meet a crops’ nutritional needs. Find out more about Polysulphate, a natural, multi-nutrient mineral, and how its unique combination of macronutrients can benefit your crops by visiting the Polysulphate website.